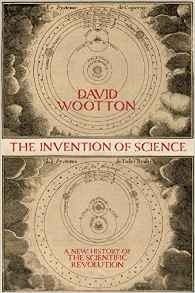 Back to the history of science with The Invention of Science by David Wootton which covers the period of the Scientific Revolution. Wootton’s central theme is how language tracked the arrival of what we see as modern science in a period from about 1500 to 1700, and how this modern science was an important thing that has persisted to the present day. I believe he is a little controversial in denying the ubiquity of the Kuhnian paradigm shift and in his dismissal of what he refers to as the postmodern, “word-games” approach to the history of science which sees scientific statements as entirely equivalent to statements of beliefs.This approach is exemplified by Leviathan and the air-pump by Steven Shapin and Simon Schaffer which gets several mentions. Wootton argues contrary to Kuhn that sometimes “paradigm shifts” happen almost silently. He also points out that Kuhn’s science is post-Scientific Revolution. One of the silent revolutions that he cites is the model of the world. “Flat-earth” in no way describes the pre-Colombus model of the world which originated from classical Greek scholarship. In this theoretical context the sphere is revered and the universe is built from the four elements: earth, wind, fire and water. The model for the “earth” is therefore a variety of uncomfortable attempts to superimpose spheres of water and earth. The Ancients got away with this because in Classical times the known world did not cover enough of the earth’s sphere to reveal embarrassing discrepancies between theory and actuality. With Colombus’s “discovery” of America and other expeditions crossing the equator and reaching The Far East over land these elemental sphere models were no longer viable. The new model of the earth which we hold to today entered quietly over the period 1475 to 1550. Colombus’s “discovery” also marks one of the key themes for the book, the development of new language to describe the fruits of scientific investigation. Prior to Colombus the idea of an original discovery was poorly expressed in Western European languages, writers had to specifically emphasise that they were the first to find something or somewhere out rather than a having a word to hand that expressed this. Prior to this time, Western European scholarship was very much focused on the “re-discovery” and re-interpretation of the lost wisdom of the Ancients. Words like “fact”,”laws” (of nature), “theories”, “hypotheses”, “experiment” and “evidence” also evolved over this period. This happened because the the world was changing, the printing press had arrived (which changed communication and collaboration entirely). Machines and instruments were being invented, and the application of maths was widening from early forms of banking to surveying and perspective drawing. These words morphed to their modern meanings across the European languages in a loosely coupled manner. Experimentation is about more than just the crude mechanics of doing the experiment, it is about reporting that work to others so that they can replicate and extend the work. The invention of printing is important in this reporting process. This is why alchemy dies out sometime around the end of the 17th century. Although alchemy has experiments, clearly communicating your experiments to others is not part of the game. Alchemy is not a science, it is mysticism with scientific trappings. As a sometime practising scientist all of these elements of discovery, facts, evidence, laws, hypotheses and theories are things whose definitions I take for granted. They are very clear to me now, and I know they are shared with other working scientists. What The Invention of Science highlights was that there was a time when these things were not true. The central section of the book finishes with some thoughts on whether the Industrial Revolution required the Scientific Revolution on which to build. The answer is ultimately “yes”, although the time it takes is considerable. It flows from the work of Denis Papin on a steam digester in the late 17th century to Newcomen’s invention of the steam engine in the early 18th century. Steam engines don’t become ubiquitous until much later in the 18th century. The point here is that Papin’s work is very much in the spirit of a “academic” scientist (he had worked with Robert Boyle), whereas Newcomen sits in the world of industrial engineering and commerce. I’ve not seen such an analysis of language in the study of the Scientific Revolution before, the author notes that much of this study is made possible by the internet. The editor clearly had a permissive view of footnotes, since almost every page has a footnote and more than a few pages are half footnote. The book also has endnotes, and some “afterthoughts”. Initially I found this a bit irritating but some of the footnotes are quite interesting. For example, the Matses tribe in the Amazon include provenance in their verb forms, using the incorrect verb form is seen as a lie. In my day to day work with data this “provenance required” approach is very appealing. The Invention of Science is very rich, and thought provoking and presents a thesis which I had not seen presented before, although the “facts” of the Scientific Revolution are well known. I’m off to read Leviathan and the air-pump partly on the recommendation of the author of this book.